After over 20 years of production the Demeter Amplification Tube Bass Preamplifier is still the only musical instrument preamplifier to incorporate truly modern tube design technology with circuit features found on only the most expensive and esoteric hi-fi tube equipment. The VTBP-201S has the warmth and dynamic range that only tubes can produce, yet has lower noise specifications than most solid state devices. When the preamplifier is driving a quality power amplifier, it delivers the punch and clarity of the best tube amplifiers plus the almost unlimited power of today's modern power amplifiers. 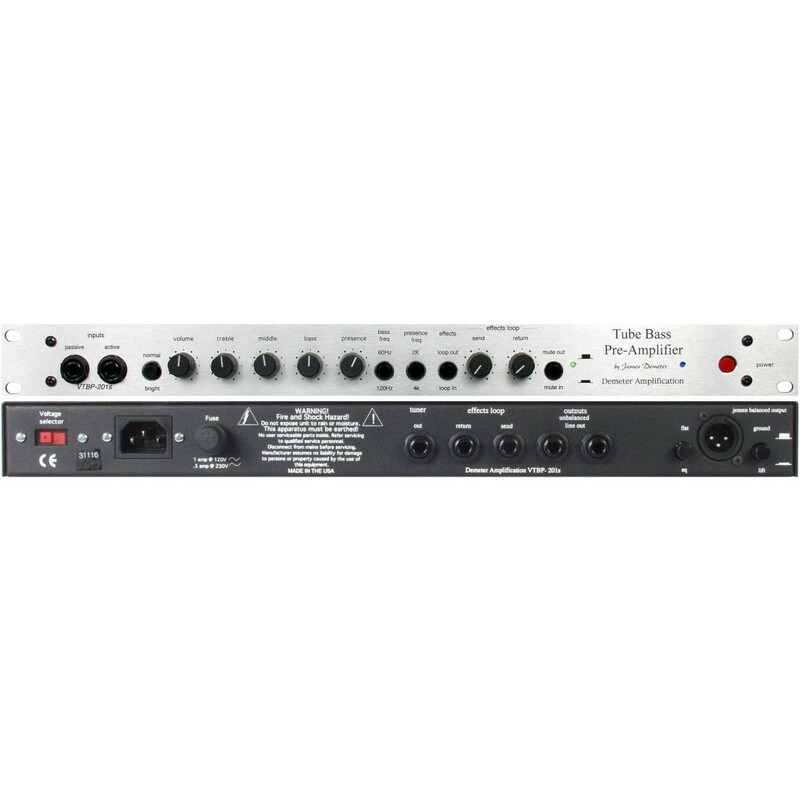 The VTBP-201S Tube Bass Preamplifier uses a regulated B+ power supply which provides quick transient response with extremely low noise. Regulated DC is supplied to the tube filament which gives the unit extremely low noise. We use only the finest 1/2 watt, 1% metal film resistors, polypropylene capacitors, high quality, computer grade switches, and a 7025A vacuum tube, factory selected for lowest possible noise and distortion. 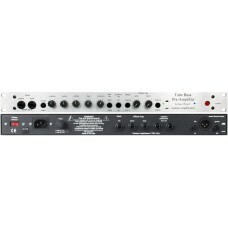 The VTBP-201S also has a low output impedance which lowers distortion and insures proper power amplifier input matching. Custom toriodal power transformer. New single space rack mount steel chassis. Each preamplifier is carefully hand-wired using only the highest quality parts and tested at our factory in Templeton, California. You can see as well as hear the quality and attention to detail on both the inside and out. Inputs: Two inputs are provided: Passive, for normal musical instrument inputs. Active, for high level active instruments. When both jacks are used the inputs are mixed equally. Treble Control: The treble control gives 6dB of boost or cut at 4kHz (6dB per octave, shelving type). Middle Control: The middle give 6dB of boost or cut at 500Hz (wide Q, peaking type). Bass Control: The bass control gives 9dB of boost or cut at a selectable frequency of 60Hz or 120Hz (6dB per octave, shelving type). Presence Control: The presence control gives up to 12dB of boost at a selectable frequency of 2kHz or 4kHz (active type, 6dB per octave). Bright Switch: The bright switch gives up to 6dB per octave of boost from 2kHz. Internal Volume Trimmer: This control is designed to match the output volume of the VTBP-201S with the input sensitivity of any power amplifier. Studio Output: The VTBP-201S features a Jensen DB-E output transformer for a balanced studio output. Tuner Output: This output is unaffected by controls. Mute Switch: Mutes the audio out. Effects Loop: Has in/out switch and level controls.